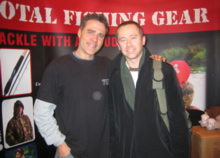 Perhaps the biggest and most publicised fishing show of the year took place recently at the NEC in Birmingham. The event was spead over three days running from Friday 3rd to Sunday 5th March. So would Go Fishing 2006 live up to expectations? Fish South East decided to pay the show a visit and check it out. First impressions of the show were favourable. When we arrived mid morning on the Friday there was already a large crowd in attendance and the place was buzzing with anticipation and excitement. The event seemed well laid out with the various fishing disciplines [coarse, fly, sea etc] all having their own seperate sections in the arena. All the major tackle manufacturers were present with plenty of freebies on offer to tempt punters into parting with their hard earned readies. The tackle was not ridiculously cheap although everything was discounted to a greater of lesser degree. Everyone we spoke to was friendly and more than happy to offer advice and assistance where required. All the usual supects from the coarse fishing world were present too....Bob Nudd, Steve Ringer, Jan Porter, John Wilson, Matt Hayes and Mick Brown to name a few. John Wilson was his usual "enthusiastic self" as we watched his talk plugging his new book in the Improve Your Coarse Fishing Superteam Theatre. Some excellent pictures from the book in the form of a slideshow made the talk even better. Others gave demonstrations of various fishing techniques which for me was the highlight of the entire show. 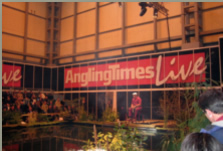 The Angling Times Live Arena sported a mammoth 1,200 square metres of space to its name. 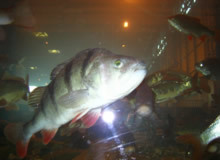 Bob Nudd, Steve Ringer and Mark Sawyer demonstrated the latest tactics in this area, which had been designed to emulate a modern commercial water with real fish inside. Although they failed to catch any of the resident fish, it was fascinating to watch. There was also a fly fishing area where experts demonstrated their particular techniques. The best demonstrations for me were in the Angling Times Advanced Tip Academy where the huge capacity tank allowed us to see how fish behave in their natural environment and how they react to bait and tactics underwater. We watched demonstrations on fishing with meat and feeder fishing which provided some good tips for those watching. All in all I would highly recommend the Go Fishing Show to anyone interested in any of the fishing disciplines. Whether you are after cheap[ish] tackle and bait, wanting to learn more about fishing or just see the "stars" in action and meet them in person you won't be disappointed. Did you visit this year's Go Fishing show? How was it for you? Let me know your thoughts via the contact page.